Foreign cars entering Singapore will be levied a new entry charge from Feb 15, in line with earlier government pronouncements that the Republic will match similar fees implemented by Malaysia. 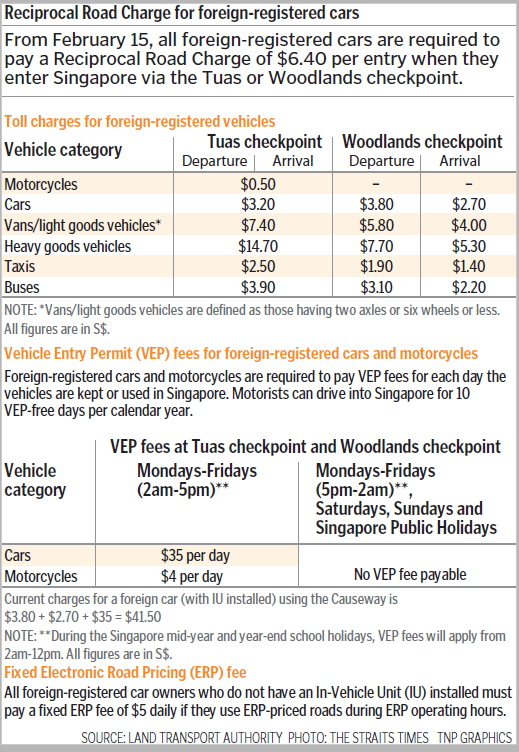 In an announcement yesterday, the Land Transport Authority said a reciprocal road charge of $6.40 per entry will apply at both the Tuas and Woodlands checkpoints. It said the fee mirrors Malaysia’s road charge of RM20 (S$6.40) for non-Malaysia registered cars entering Johor, which was implemented on Nov 1 last year. This entry was posted on January 17, 2017 at 9:29 am and is filed under Singapore. You can follow any responses to this entry through the RSS 2.0 feed. You can leave a response, or trackback from your own site.